Buy this item and earn 1,255 ClubPoints. 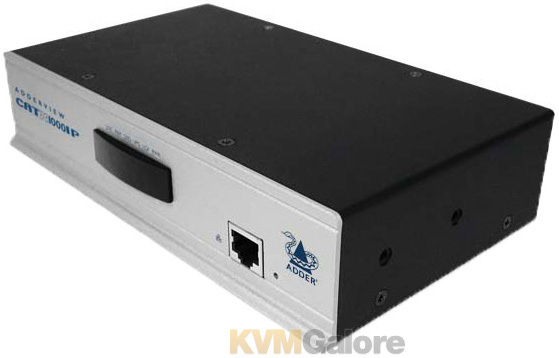 AdderView CATxIP 1000 is a high density, small form factor, 16 port KVM switch that provides local and global access for users who need to control multi-platform operating systems and hardware. AdderView CATxIP 1000 combines USB console support, global IP access and a full KVM feature set to create a truly modern KVM switching solution delivering high quality video and CD quality audio. A focus on flexibility means the AdderView CATxIP 1000 is equally suited to applications from professional server installations or industrial processes through to office control. AdderView CATxIP 1000 makes full enterprise grade functionality and quality available to everyone in a compact desktop format. • USB keyboard and mouse control: Any USB style keyboard and mouse (PC, Mac or Sun) can be used to control the AdderView CATxIP 1000 switch. Full keyboard re-mapping is supported to ensure seamless cross platform functionality. • Faultless video quality: AdderView CATxIP 1000 provides exceptionally high video performance to local users, supporting up to 1920x1200 resolutions with DDC emulation which is further enhanced by DC balancing to ensure full and true color. • True multi-platform support: The AdderView CATxIP 1000 supports any computer platforms with PS/2, USB and Sun keyboard and mouse interfaces. Country code reporting, DDC and continuous keyboard and mouse emulation ensure faultless operation. • Easy cascade: Expand simply by using just CATx cable to link units. The CATxIP 1000 automatically detects cascade connections to support up to 256 computers. Fit 32 performance KVM connections in 1U of rack space. • Optional CD quality audio: AdderView CATxIP 1000 switches support CD quality 44.1kHz digital stereo audio when optional audio enabled CAM modules are used. • Global User (IP): Employing enterprise grade security (using AES 128 bit encryption and RSA 2048 bit public key authentication) Use Java web browser or Real VNC client software that, unlike HTTPS web browsers, is designed specifically for secure, high performance KVM over IP applications. • Up to 1600x1200 resolution for remote IP access with scalable windows. • Computer Access Modules: Flash upgradeable CAMs are available for PS/2, USB and Sun keyboard and mouse support with optional audio. • Rack mount / rack drawers: One or two CATxIP 1000 switches can be mounted in 1U of rack height giving a maximum of 32 ports per 1U. The small size also makes the units ideal for mounting behind KVM rack drawers. • User access control: Up to 16 different user profiles can be created and access rights for each user can be defined. 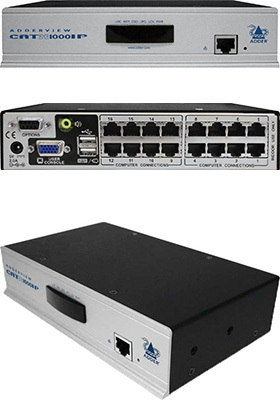 Listed below are additional products to consider which are compatible with AdderView CATxIP 1000, 16-Ports. These items may be required to complete your system.